OraMetrix and Imaging Sciences engineered a new 3-D scanning capability with the SureSmile system that is quicker and more comfortable for patients, and that captures the needed data for individualized, quality SureSmile treatment. We are committed to helping doctors find more efficient and convenient ways to leverage our technology for optimal patient care and treatment results. OraMetrix, maker of SureSmile, an orthodontic system that combines 3-D diagnostic imaging with computerized treatment planning and robotic archwire customization announced a new capability with i-CAT® Next Generation by Imaging Sciences. This new application used with the SureSmile system provides the same detailed information for orthodontists to plan and treat with a high level of accuracy with a 43% reduction in radiation dose. The i-CAT/SureSmile scan protocol is reduced from 26.9 seconds to 14.7 seconds representing a 45% faster 3-D scan when used with SureSmile. OraMetrix and Imaging Sciences engineered this new capability for an orthodontic experience that is quicker, easier, and more comfortable for patients, and yields the detailed data needed for individualized, high quality SureSmile treatment for patients. “We are committed to helping doctors find more efficient and convenient ways to leverage our technology for optimal patient care and treatment results”, said Charles Abraham, CEO, OraMetrix Inc.
SureSmile recently added a revolutionary new capability to its latest software release, SureSmile 6.0. 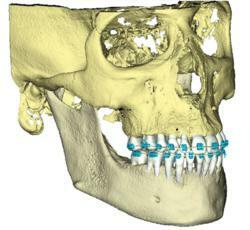 New features allow orthodontists to visualize and plan the final root positions in the supporting bone. SureSmile 6.0, in combination with i-CAT Next Generation scans, provides orthodontists sophisticated treatment planning tools to provide patients with a high level of care. The SureSmile orthodontic treatment system enables doctors to proactively plan tooth movement on virtual digital models and customize prescriptive archwires for more precise and efficient treatment. Established in 1998, OraMetrix developed the SureSmile system, a revolutionary new digital technology that equips orthodontists with a powerful diagnostic and treatment tool to deliver precise, customized orthodontic care. According to an April 2012 study published in Orthodontics: The Art and Practice of Dentofacial Enhancement, SureSmile was shown to reduce median treatment time from 23 to 15 months based on a comparison of 9390 SureSmile patients and 2945 conventionally treated patients. Since 2004, SureSmile has been used on 100,000 patients by over 400 orthodontists in the United States, Australia and Canada. OraMetrix headquarters are located in Richardson, Texas. Serving the dental industry since 1992, Imaging Sciences, is at the global forefront in the development and manufacture of computer-controlled dental and maxillofacial radiography products, and internationally recognized by highly regarded dentists and radiologists as one of the most innovative companies in dental imaging. i-CAT systems offers clinicians enhanced features for highly effective treatment planning and surgical predictability.